Good morning and welcome back to the circus. To be sure, the level of macro uncertainty clearly spiked on Friday and the prognostications of the BREXIT vote are coming fast and furious. But the bottom line is the stock market was fooled on Friday and traders (and their margin clerks) took action quickly. The question, of course, is if Friday's fireworks will continue - or - were merely an overreaction. Time will tell. So, without further ado, let's move on to our weekly review of the state of the market and our major market indicators/models. The short-term trend is now down (feel free to insert "duh" emoticon here). Q: Would the level of Friday's decline have been as large if it hadn't happened on a Summer Friday? Even from a short-term perspective, major indices still in trading range. Key test for both teams will come at S&P 2020. A meaningful break on a closing basis of 2020 will likely trigger test of retracement levels. A move to 1965 would represent a pullback of -7.3%. Recent declines (August and Jan/Feb) have exceeded 12%. While it may be surprising to those short-term traders, nothing really changed Friday from longer-term chart perspective. 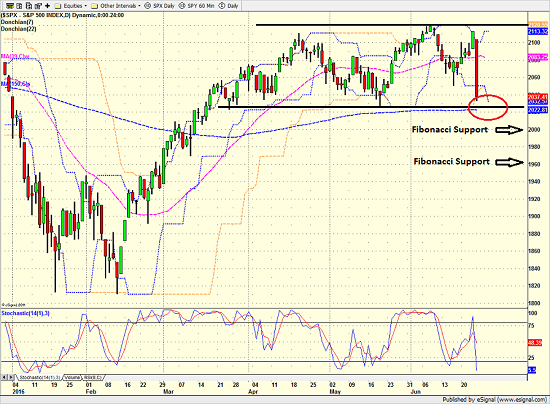 Looks like another trip through the trading range may be on tap. As shown on the chart below, this would mark the 6th trip through the range. Bottom Line: A break below 2000 is meaningful from a weekly chart basis. 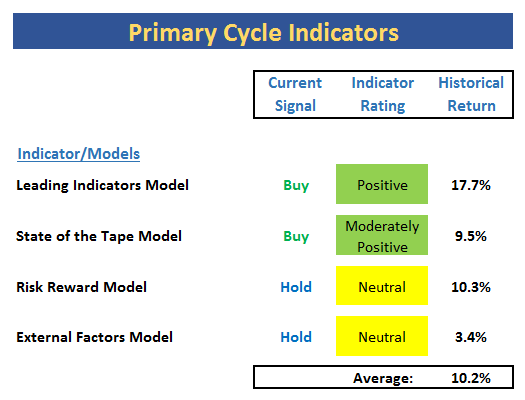 The short-term trend model is now slightly negative. But, the intermediate-term trend models remain neutral. The S&P has fallen enough for the channel breakout system to be near an intermediate-term sell signal. However, with stocks in a mean-reverting mode, a modest reversal would trigger a buy signal in my channel system. 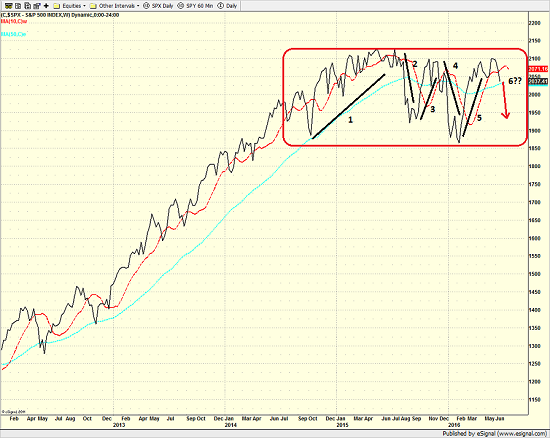 The cycle composite points up for next couple of weeks. The short-term trend & breadth confirm system is now negative (no surprise here). Intermediate-term T&B model only neutral. No real damage to the Industry Health Model (means that majority of the 104 subindustry groups remain technically healthy). Intermediate-term volume relationship model remains negative. The volume relationship models have done a good job in reminding us that all has not been well in this market from an internal standpoint. Stocks oversold from short-term perspective. Stocks moderately oversold from intermerdiate-term perspective. Remember that stocks can stay overbought/sold for extended periods of time during meaningful trends. 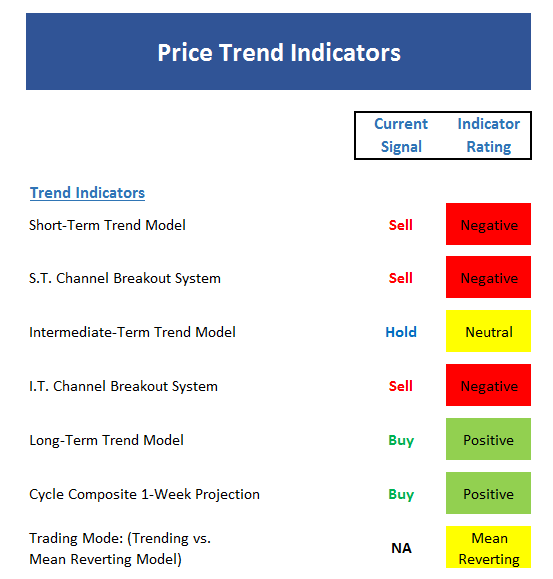 Mean reversion model gave buy signal this week - unfortunately this was an early signal. 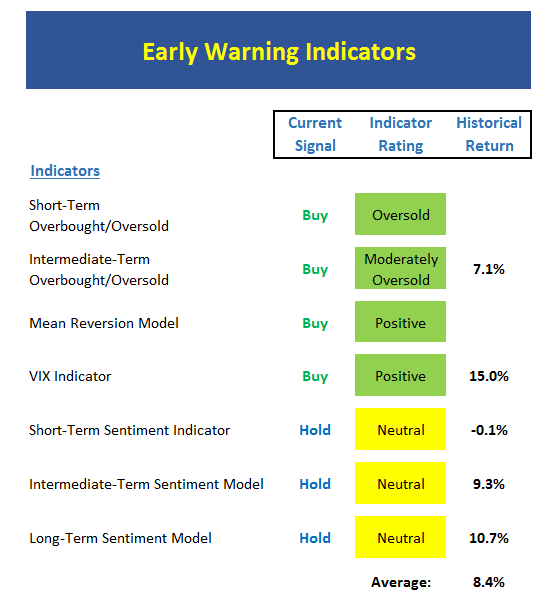 VIX model is close to flashing a new buy signal (however, it too flashed an early/wrong buy signal). 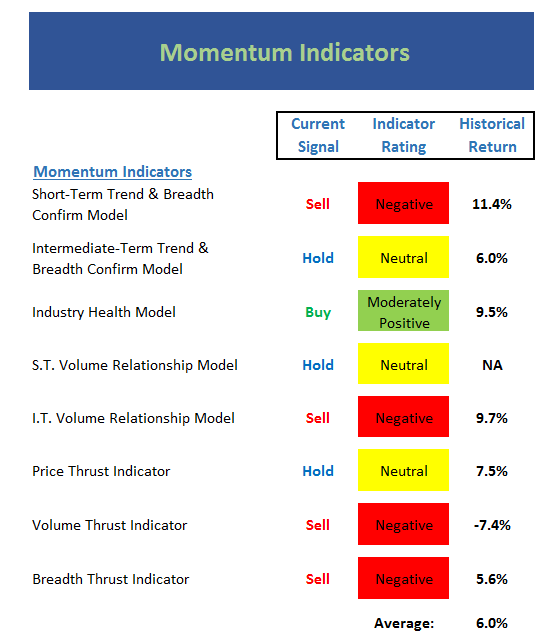 Sentiment models are now neutral and not yet at extreme levels. Absolute monetary model back to positive due to yields diving. Weekly close for yield on 10-year is lowest since November 2012. No change to economic models this week. Internal component of inflation model did uptick (meaning inflation expectations rose slightly). Another one bites the dust... 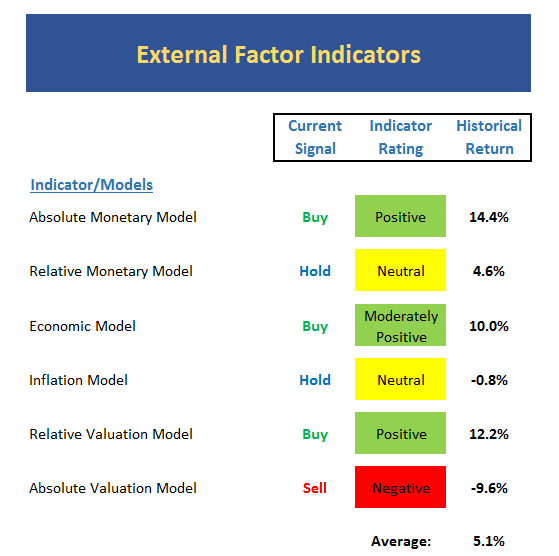 The External Factors Model went neutral early last week. The risk/reward continues to wave yellow flag and has done fine job of "calling" the overall environment this year. Historical returns for this board remain at long-term average levels. With only one of the indicators on this board solidly positive, the takeaway should be obvious - this is not a strong environment. The market freaked out again on Friday. The question, of course, is if there will be follow-through. Thus, Europe will lead the way forward for a while. It is worth noting that the level of macro uncertainty increased on Friday. This may become yet another overhang for bull camp. In short, volatility should remain elevated in the near-term. And as I've said a time or twenty this year, we continue to believe that the dips such as this one should be bought - once the emotional trading subsides, that is. 1. The Impact of the "Brexit"